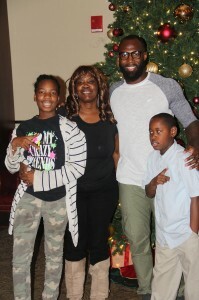 It was a scene of hustle and holiday cheer as Philadelphia Eagles Free Safety Malcolm Jenkins and The Malcolm Jenkins Foundation (TMJF) provided holiday meal baskets for 135 Philadelphia families at the Foundation’s Holiday Dinner Basket Surprise. Taking place in collaboration with Mayor Michael A. Nutter’s Annual Holiday Event, hosted in partnership with the Fraternal Order of Police (FOP), the inaugural event provided turkeys, provided by Giant Food Store, and baskets with food inclusive of everything needed to prepare a traditional holiday meal. Reflective of the jersey number (27) that Jenkins wears on the field, the Foundation engaged 27 area churches and organizations to each select five families in need of the festive blessing, before distributing the baskets to their communities. In addition to handing out dinner baskets, TMJF, the Mayor’s Office, the FOP and special guests that included 6abc’s Sharrie Williams and award-winning trombonist Jeff Bradshaw, welcomed an additional 27 families with children under the age of 12 and provided lunch before surprising each child with a bag of toys. Annually, The Malcolm Jenkins Foundation’s Holiday Dinner Basket Surprise has served 135 families in New Orleans since 2011. Striving to make a sustainable impact on young people and their families in every city in which Malcolm Jenkins has lived, played, and attended school, the effort has now expanded to Philadelphia.